With the introduction of Christmas light projectors, the traditional method of hanging Christmas lights is rapidly becoming outdated. The benefits of using a Christmas light projector makes it the number one choice when it comes to creating an outdoor/ indoor statement. They are not just safer (as there is no need to climb high places to have them fixed), but less time-consuming and even cheaper in the long-run. There are a number of options out there when it comes to finding the perfect Christmas light projector; unfortunately, there are a lot of low-quality products and false advertising too. After 30+ hours spent researching Christmas light projectors and seeing a few in person, we think The Star Shower Laser Motion Light Projector is the best choice. Our choices have been selected via an intensive research process and customer reviews of those who have not just used these products, but also tried out a number of others available in the market. 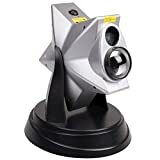 The Star Shower Laser Motion Christmas Light Projector offers you the option to transform your home from a dark/dull ambiance to a bright dazzling display of lights; With the click of a button. Watch the stars dance right before your eyes or freeze them with just a click. To make the choice a lot easier for you, we have narrowed down your options to the 7 best Christmas light projectors for your home this season. We hope you’ll find this very informative. 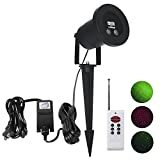 With the Star Shower Laser Light Projector, you get to kill 2 birds with one stone, thanks to its weatherproof capabilities; making it possible to be used both indoor and outdoor. This laser light comes with a long stake perfect to place the projector in your yard. With just a click thousands of green & red stars explode into motion. Just one or two of this laser light would be enough to cover a good amount of outdoor space, or you could bring the fun indoors to light up your Christmas setup. The Star Shower Laser Light projector eliminates the stress and time involved in setting up Christmas lights around the house, no need for ladders or putting up nails and screws all over the house. Light sensor turns on at night and turns off in daylight. Choose Red and Green or all Green laser lights. Includes base and extended stake. No hanging lights and no dead bulbs to deal with. A set of 2 or more is needed to get the best result outdoor. 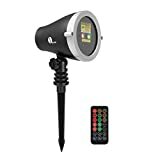 The B-right Static Red and Green Sparkling Landscape Laser Light is a weatherproof light great for your outdoor and indoor setup. Give your outdoor space that extra touch needed with this light and watch compliments come your way all through the season. This light works by projecting several hundred laser lights out in a diamond-like pattern and it comes in a number of lighting options. When the light is placed just right, it is able to cover the whole front or side of your house, it projects two colors (light red and green); which can be turned on together to light up either red or green. There are also various modes and options available, you can have the lights flash or transition back and forth between both colors. Green & Red beams, Cover an area of 25×25 ft. Remote Control: Color change option (Green & Red): single green, single red, or green & red. Remote control distance: 0-10 meters. 24 hours circularly timer setting: 2H, 4H, 6H, and 8H. Lights are bright and perfect for outdoor use (could also be used indoors). Few customers complained receiving defectives (customer service handles this though). For Longer lifespan, we suggest you Run it 4 hours and rest for 30 minutes in the summer. In winter; you can run it for 6 hours and rest for 30 minutes. Bring the brilliance of stars to your home. With the Blimark IP65 waterproof laser you will enjoy a stunning display of lights perfect for holidays, parties, celebrations and more. Weather Resistance: Remain indoors stress-free, regardless of the weather outside. Coverage: The area covered by this laser light is pretty amazing, it can cover 4,000 square feet. Customization Options: There are various customization options to have your home stand out from the rest, you can have the light flash, twinkle, or stationary. Remote Control: The lights comes with a wireless remote which allows you to have the light transition in the mode that best fits you. You can also use the remote to switch between light colors. Multiple Colour Modes: You have three color choices; it could be red, green or a combination of red & green. There are also 2 major lighting modes; you could have the light in static mode or flashing mode. 1byone outdoor Laser Light is a laser light system that illuminates a huge area with thousands of gorgeous, colorful lights (Red and Green). It’s simple, all you need to do is find the perfect location in or outdoor to place it and once it’s switched on, it will illuminate a huge area with brilliant red and green sprinkles. This light is not just perfect for Christmas, but could also be used for a long list of events and activities. it could also be used to brighten the kids’ bedroom at night. Amazing Illuminations: Plug in, turn on, and watch your home magically be transformed by amazing green and red lights. Coverage: The laser lights can cover up to 2,100 square feet stretching as far back as 25 feet. Display Options: You can either have the light set to flashing or stationary. Cost-effective – In the long run, you will realize this were the best options, as they do not need replacing over time and since it comes in a simple package; storing them are very easy. Automatic Timers – With a built-in timer function, the laser light will automatically turn off after 6H of use and turn on again after 18H. You can also use the remote control to set the timer as required. Weather Resistance – Rated IP65 light casing and with an IP44 power adapter. Materials: Aluminum alloy casing and spike. Tempered glass lens. It is a solid product: Almost everything has been made of aluminum for durability, except the remote control which is plastic. It’s customizable: By default, it shines red and green laser lights; however, you can adjust them in different ways. You can shine only one single color (red or green), or rather go for the flashing option. You can also dim red, making the green more prevalent. It has a built-in timer: You can set the light to come on at a set time of your choice. It is weather resistant And Waterproof: Given it’s made of aluminum, they won’t be affected by the weather; avoiding rust or the sun dry-rotting it. The remote uses infrared and only works if you’re standing in front of the light. If the light is facing away from you, the remote is useless. The lights aren’t super bright: The lights are perfect indoors, but a single unit might not give you the result needed outside your house (2 or more will do the trick). 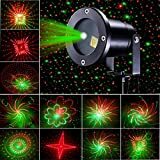 This indoor laser stars projector is created from a powerful Green laser and holographic technology; it is currently one of the most amazing laser hologram projectors of its kind in the market. You will be blown away the moment you see this projector in action, the neighbors will come knocking just to get one of them for their homes too. The beauty about this light is it’s fully adjustable, requires no setup and will fill any room regardless of size, with a crystal clear animated star display. 2 Built-In precision glass lenses transform the largest or smallest rooms into your own personal animated universe by creating thousands of stars with or without cloud formations. Includes built-in key hole for optional wall mounting. Uses a new green laser and holographic technology which is simple to use. A truly amazing display of lights, stars, and clouds. For best performance, it is advisable to use it for not more than 4 hours at a go. The beauty of the BSTPOWER Snowflake Christmas Projector Lights is that it’s flexible and comes with a number of customization options. With this light projector, you can switch between slides; which makes it not just suitable for Christmas, but for various occasions and holidays throughout the year. If you are looking for something different from what everyone else has, this is definitely something you should consider. Unit stays on for 6 hours and automatically shuts off for 18 hours. It is not as heavy since it is made almost entirely of plastic. It is waterproof (can be used outdoors). It has a long power cord (16′). Come with motion setting, making the display adjustable at the speed of your choice. Comes with a number of display slides, giving you the option to switch between various displays. Not the best for outdoors (Lights are not bright enough). Shut off time (18 hours) is too long. The Jeteven Waterproof Laser light is a must have for Christmas or parties. The setup is very easy and the product is of good quality. The bright red & green lights cover a good amount of space and it’s loved by kids. This light projector also comes with a remote; which helps with the choice of lighting patterns you want (single light only, both lights on at the same time, speed of each individual light and lots more). Function: RF remote control; used to control the lighting options, speed, pattern, and timing. Waterproof grade: Power IP68, (product) IP65 waterproof. LED light color: red, green; presenting gorgeous but not mixed and disorderly feeling visual effect.